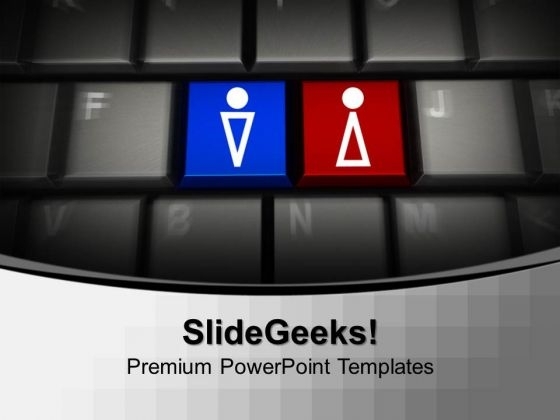 Computer Keyboard With Male And Female Keys PowerPoint Templates And PowerPoint Themes 1012-This Keyboard based template helps expound on the logic of your detailed thought process to take your company forward. It relates the concept of genders with the Computer Education, Laptop etc. It portrays the concept of how person utilizes the computer education.-Computer Keyboard With Male And Female Keys PowerPoint Templates And PowerPoint Themes 1012-This PowerPoint template can be used for presentations relating to-"Computer keyboard with male and female keys, business, computer, technology, signs, internet" Increase productivity with our Computer Keyboard With Male And Female Keys PowerPoint Templates And PowerPoint Themes 1012. You will come out on top. Deliver your address to your congregation. Give them a glimpse of the divine with our Computer Keyboard With Male And Female Keys PowerPoint Templates And PowerPoint Themes 1012.